A shorter post today, as this afternoon I’ve got to prepare 50 lbs. of chili con carne (and let me tell you, I can taste it already). German meteorological and climate site Schneefan (snow fan) here writes on the recent changes by the DMI on its Greenland ice mass chart. Personally I wouldn’t be surprised if this were in part due to climate data embarrassment. Schneefan writes that the Danish Meteorological Institute (DMI) recently changed the reference period for showing the Greenland ice mass: from the warmer 1990-2013 to the internationally usual but colder WMO climate period of 1981-2010. The change over to the WMO-recommended older and colder reference period has the effect of making the massive ice growth of the past two years with respect to the new mean look smaller, as the current comparison shows (lower chart). Top: The total daily contribution to the surface mass balance from the entire ice sheet (blue line, Gt/day). Bottom: The accumulated surface mass balance from September 1st to now (blue line, Gt) and the season 2011-12 (red) which had very high summer melt in Greenland. For comparison, the mean curve from the period 1981-2010 is shown (dark grey). The same calendar day in each of the 30 years (in the period 1981-2010) will have its own value. These differences from year to year are illustrated by the light grey band. For each calendar day, however, the lowest and highest values of the 30 years have been left out.“ Source: http://www.dmi.dk/surface-mass-budget/. By changing the comparison period in April 2017 from 1990-2013 to the older and colder WMO 1981-2010 climate period, the mean shown by the gray line and shaded area is raised. This is illustrated by the thin black lines I’ve added to the two lower charts showing the old mean peak value. Using the 1990-2013 period, the mean peak value was about 550 gigatonnes. Today using the older and colder WMO 1981-2010 the mean yearly peak rises to about 600 gigatonnes. As a result the current curve shown in blue the strong ice growth during September 2016 becomes less apparent. Moreover, the strong 2015/16 ice year year has been left out (brown curve in the old chart, left). Finally, it’s good to remind readers that despite the powerful El Niño, RSS stellite data show no warming in close to 20 years. Source: The Pause hangs on by its fingernails. of course it does. Your graph is flat out false (too old). As usual your are just wrong sod. That graph is correct as shown, as usual you wish to compare apples and dates. This is a plain out lie. The graph is simply outdated. If you choose start and end point, you can get any effect in basically any graph. That method is anti-science. 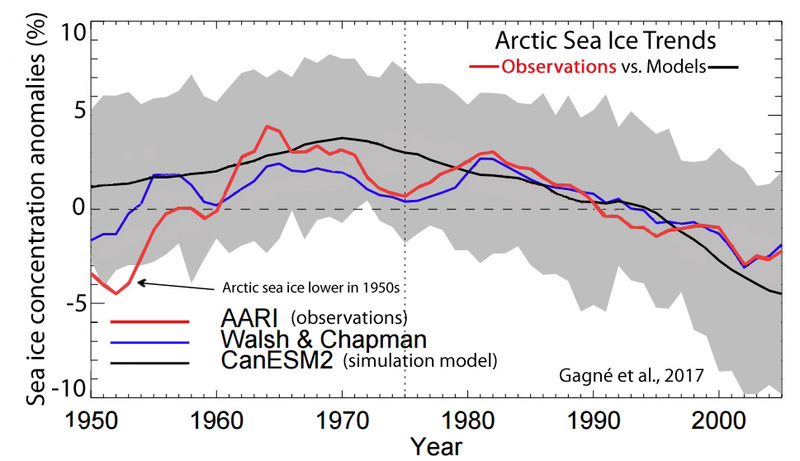 Warmists always start Arctic ice level graphs at 1979 when ice was abnomally high (SAR onwards), and ignore the previous 5 years (shown in FAR). Now why would the IPCC would do that? because that is when satellite data started. educate yourself please! sod, Jeff Todd obviously knows that the satellite data did not begin in 1979. It began in 1973 with the NIMBUS dataset. The 1990 IPCC report included the 1973-1978 data, but because the sea ice coverage was so much lower during those years, and 1979 had some of the highest sea ice extents, the 1973-1978 data was excluded from subsequent reports so as to make the more recent melt rate look worse (and to have a very convenient start year with the coldest temperatures of the century in the Arctic — 1979 — as the starting point). 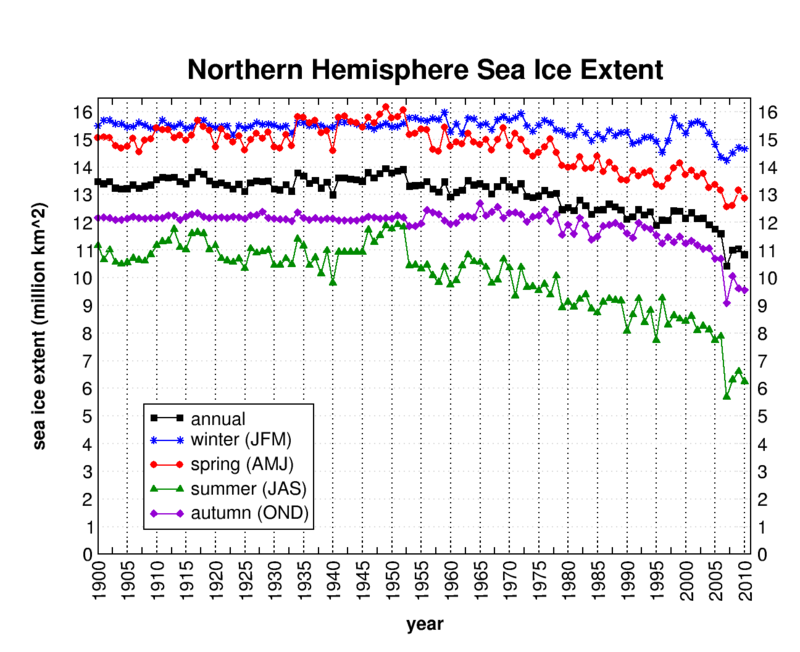 … when Arctic sea ice extent was lower. Why is it that you are so, so IGNORANT about these things ?? Your education is sadly LACKING, sob., !!! here is a full graph. The NOAA had no problem with the 1973-1979 sea ice data,as they accepted it and discussed it,in their 1991 report. It starts on PDF page 59. The 1973-1979 sea ice data is still valid today, no credible reason to exclude it from today’s sea ice charts. So you dislike the earlier start date? And yes you are still wrong! It’s definetly wrong to include a transients El Nino event at the start, but ignore it at the at. I think what Sod i refering to is the practice of whoever compiles a graph to chose start and enddates carefully to match whatever they want to express. And that’s is definatly strange, if not wrong. Personally I think looking back 15 years, 30 years, 100 years, etc is too short. Not even the past 400 years, because back then we were in the depths of the LIA. 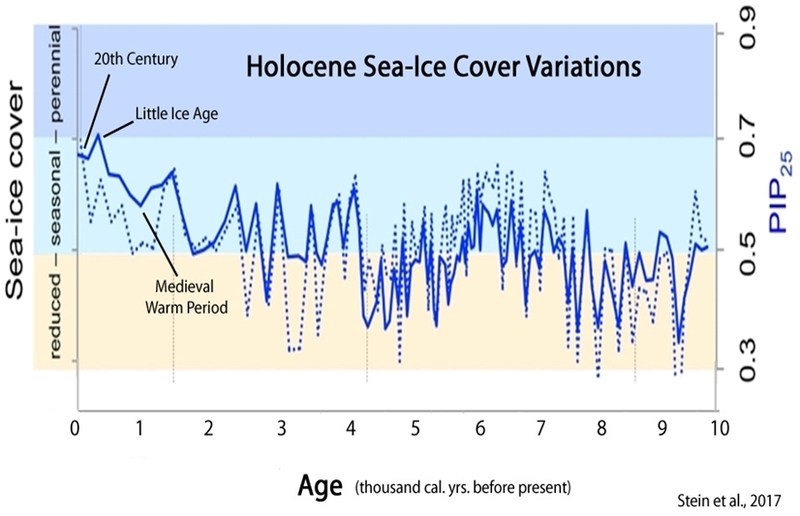 If you really want to see what is happening you need to go back 1000 years, and even better: the entire Holocene. If one does that, then today’s climate is NOTHING NEW. Unfortunately it is the warmist activists who insist on tunnel vision at such short timescales, and so the fight is forced into that gutter. What kind, and how much partial data from the mid-1960s is there? Both military and NASA/NOAA. I remember how our news used to brag about the discoveries etc from the mid 60s, onward. Latest El Nino was nothing but a transient. The Temperature has dropped back down to the previous hiatus level. Of course , if you are ignorant enough to include these transient events in linear trend calculations without actually thinking, then an false trend will show up. It was 0.4 degrees warmer than after the last El Nino. Also i think it is too early to tell if we are “back down to the previous hiatus level”. Ha ha ha, Sod when will you stop making a complete fool of yourself? Your chart shows a .10C warming in about 20 years time (.05C per decade), WAAAAAY below the IPCC projected per decade warming rate,of .30C per decade. You show that the AGW conjecture is failure, using YOUR own line of argument. 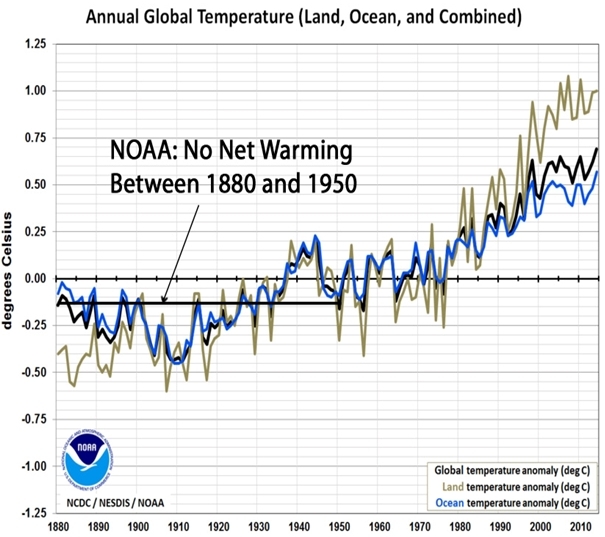 Climatologically speaking, it makes sense to use a 30-year baseline for comparisons. Yet one has to wonder why DMI didn’t do that a long time ago and instead began with the year 1990. Question: given that 2012’s strong melt season pulled down the chart overall, and it’s been stated that the lowest and highest for each date has been removed from the grey-shaded area of the chart, wouldn’t the 1990-2013 chart have had 2012’s season removed from calculations and been already raised? More explanation than a simple one-line update needs to be given to the public. By changing to the 1981 – 2101 period they are including much more of the climb out of the EXTREME COLD of the late 1970’s. 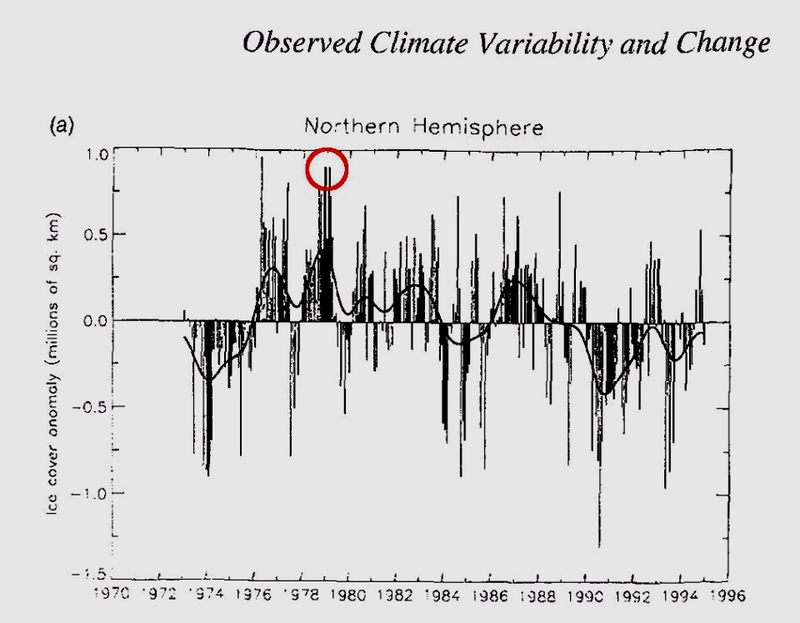 That EXTREME COLD of the late 1970’s is the only reference period that makes sense to the AGW scam. The Icelandic sea ice index shows that period to have had sea ice extents as high and much of the Little Ice Age. It is also the very bottom of the AMO cycle, while we are currently at the very top. It is absolutely remarkable, and a very bad indicator, that the SMB of Greenland is so incredibly HIGH this year, far higher than one would ever expect for the phase of the AMO. A very ominous warning for a cold future. Is that so? Overlaying the new chart over the old one reveals that the slope/gradient increases with the new mean … wouldn’t that also strengthen any impression of an increased ice growth? As I said above, at the current phase of the AMO, ice growth should probably be lower than average. ….. but is way above average. Growth vs. absolute ice extent. Artic sea ice extent is barely reaching last years extent and it is currently below the 2012 line. We’ll see how this develops over there sommer, wont we? Sea ice was just as low or lower as modern times during the 1930s and 1940s, when CO2 was 310 ppm. And there is more sea ice now than for nearly all of the last 10,000 years. And Greenland’s ice sheet is more advanced now than nearly all of the last 10,000 years too. 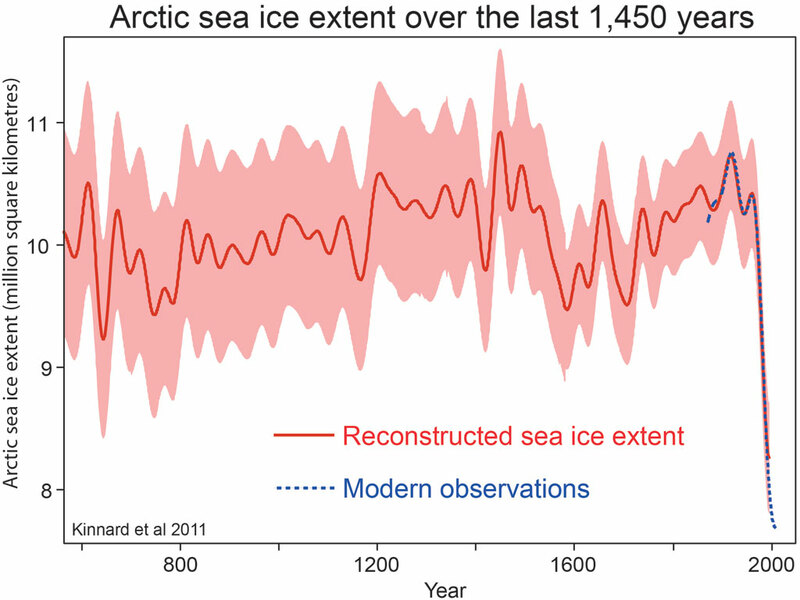 The ONLY time that Arctic sea ice has been higher than current was in the lead-up, during, and the warm-up after the Little Ice Age, which was the COLDEST period in the last 10,000 years. 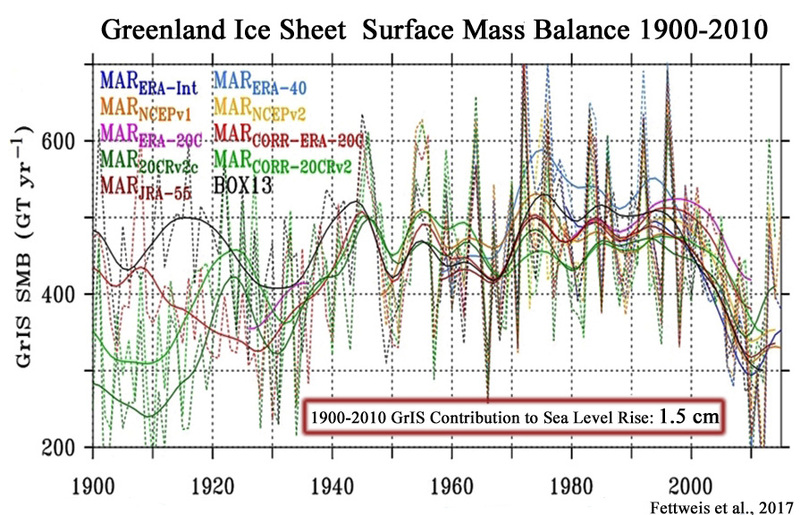 Icelandic sea ice data shows the late 1970’s extent was up there with some of the EXTREMES of that COLDEST of times. Sea ice was much higher 20 years ago. You know nothing! By “current”, AndyG likely meant “the modern era”, which includes the two 20th/21st century Arctic warm periods (1920s-1940s and 1990s-present). Yes, it’s true that sea ice was higher in the 1970s than it was in the 1930s and 1940s. The ONLY person with less brains that seb.. is sob ! Do try to comprehend facts .. for once in you pathetic life, sob. ! Why does this chart look different then? Ooh, SebastianH has found a graph from Gavin’s NASA. 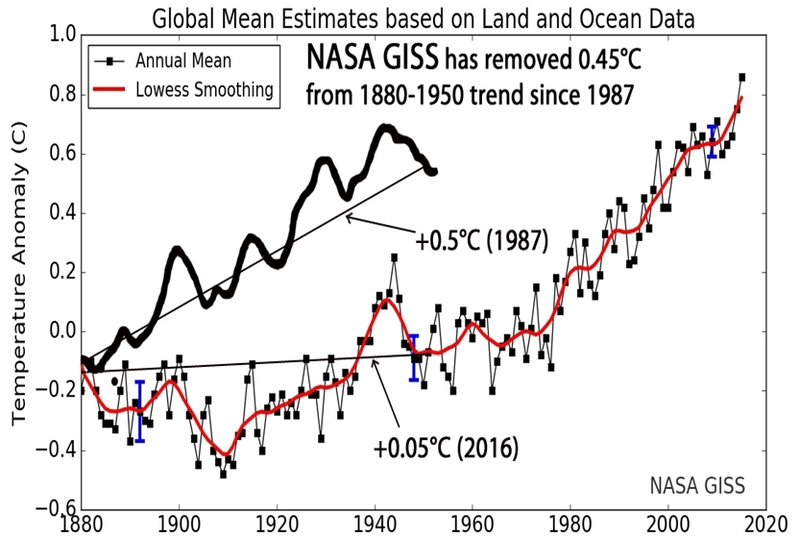 …but the 2016 NASA graph has the 0.5 C warming removed and replaced by a “warming” trend of 0.05 C instead? … so many charts of Arctic sea ice extent not being lower in the past. Oooh, Scientific American. The magazine that calls carbon dioxide a “pollutant”. Yeah, they’re reliable. Yep, the late 1970’s were up there with the EXTREMES of the LIA, showing just how cold the climate still is. 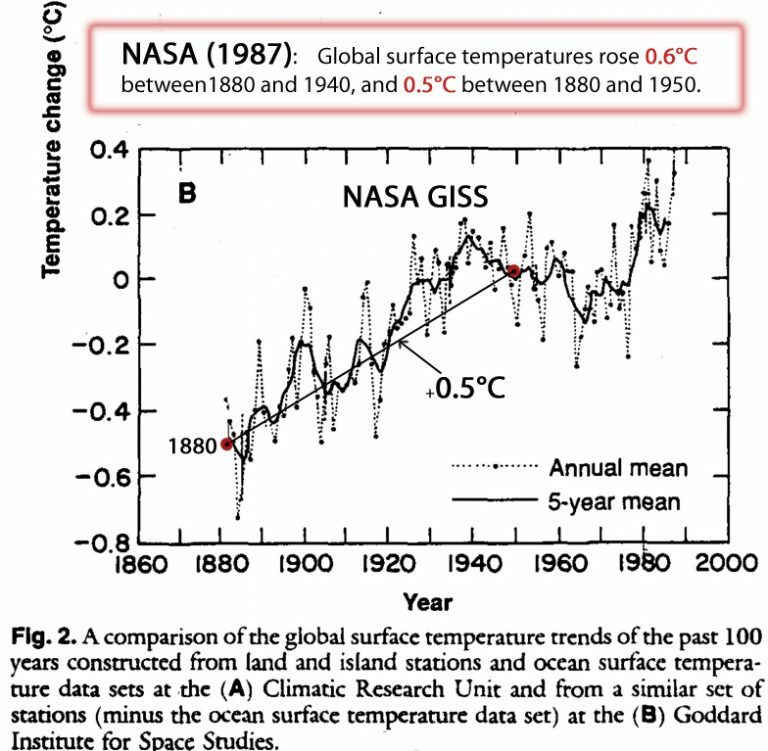 why do you not post the accurate information from the LIA with error bars that are comparable to satellite data today? that is a REGIONAL reconstruction. I would call this fake science at its best, it also is an utterly absurd TRICK. 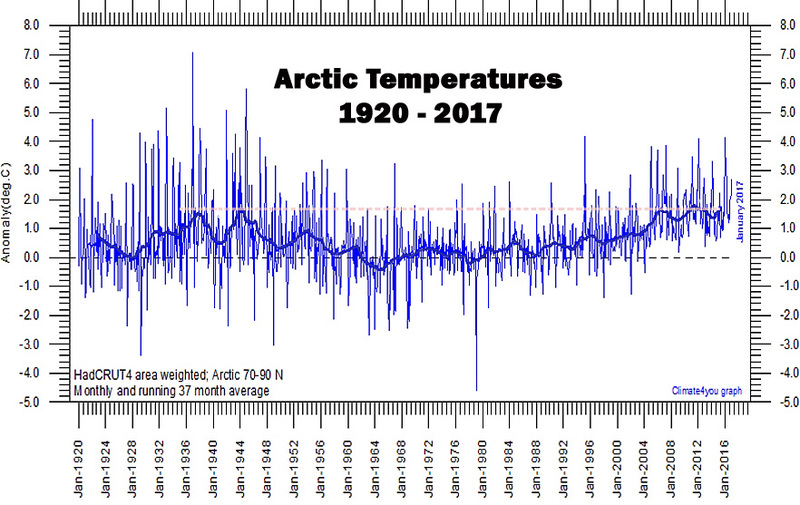 sod, the entire Arctic region is no warmer now than it was in the 1920s to 1940s. The Greenland Ice Sheet warmed up by 2-4°C in less than 10 years during the 1920-1930 period. At the time, anthropogenic CO2 emissions rates were 10 times smaller than they are now, and atmospheric CO2 was 310 ppm and flat. Between 1940-2000, when CO2 concentrations rose by 75 ppm and human emissions rates rose 8-fold relative to the 1930s…the Arctic region cooled. In other words, the Arctic warms and cools without any significant contribution from human activity. A significant and rapid temperature increase was observed at all Greenland stations between 1920 and 1930. The average annual temperature rose between 2 and 4 °C in less than ten years. Since the change in anthropogenic production of greenhouses gases at that time was considerably lower than today, this rapid temperature increase suggests a large natural variability of the regional climate. So you admit you don’t have any such information yourself to discount this fact otherwise you would post it. You poor non-informed sob. !!. Why are you ALWAYS DENYING CLIMATE CHANGE. ? Is it that you DON’T BELIEVE in climate change ?? You are the very last person to judge what is fake science (YOUR belief system) and real science. (NATURAL VARIABILITY). You have proven time and time again that you haven’t got even the most basic clue about anything to do with science. This information has been posted MANY times. and the MANY biodata proxies. Real SCIENCE is never in your realm of comprehension.. you are brain-washed to just DENY it. The Nation Magazine didn’t even grasp that if what Bill Nye said is true, CO2 is the greatest gift man has ever been given. Forget New York flooding in 10,000 years due to global warming, New York would be covered in ice after just a few years of an ice age. 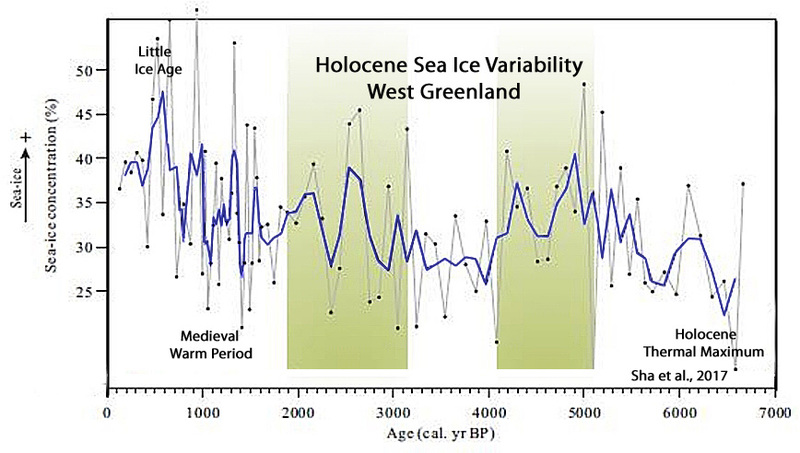 Societies collapse and die during ice ages, they thrive during warming periods. Liberals are so blinded by their ideology they don’t even understand how insane their positions are. Possible death 10,000 years in the future due to warming, or certain death during an ice age. Bill Nye makes is sound like the certainty of death and misery during an ice age is preferable to continued warmth. No, he would not prefer an ice age. He says that global warming would prevent the next one. The article “attacking” Nye on “The Nation” looks pretty good to me: They are asking him to use more science when he is on TV to counter denialist point. I disagree with tat assessment, but it still is a very sensible one. Nye has ZERO science to counteract anyone. He is very like you, sob. Glad to see you’re now a spokesperson for Bill Nye. How much does he pay you? Or is this yet another example of lefty presumption, where you believe you know how other people think and what are their motivations. Commentary: Can we stop pretending Bill Nye is a science guy already? Bill Nye is a pathetic socialist warmist ignorant loudmouth idiot. No, the entire hemisphere can warm up by 4 or 5 degrees within a few decades without any CO2 concentration changes. What causes that, SebastianH? we get it. There was extreme natural warming in the far past, today we only have fast cooling. And proxies from 10000 years ago are absolutely accurate, surface station data is total garbage. It looks pretty warm outside right now. Can i leave the house or is an ice age moving in this afternoon? Wow. That is an absolutely pathetic “rebuttal”, sod. No, and ice age is not moving in this afternoon. At least I hope not. Actually, paleoclimate cooling trends are much longer in duration than the explosive warming trends. And no one has ever written that “proxies from 10000 years ago are absolutely accurate”. So your straw man has been noted. But yes, much of the instrumental temperature record has been corrupted by artificial warming (UHI) and unsubstantiated “adjustments”. Get sober before your next post, sob. !! Bill Nye is not a scientist. He just played one for kids on TV. So that makes him perfect to be a leading spokesperson for Climate Change in the minds of those that would believe his drivel. I mean after all, since Nye had an engineering degree and played a scientist on TV he is even more qualified to talk about climate change or any science, other than so called “political science”, than Al Gore! “Temperature and winter-precipitation will increase, the sea-level will rise and Denmark will experience more frequent and more severe extreme weather events. Yes, DMI are fully sucked into the AGW scam. Quoting IPCC reports which are NOT SCIENCE, but are blatant propaganda, unsupportable by any real data. That is why DMI must be constantly checked for changes that enhance the AGW scam.